Unknown origin. Possibly from Welsh pen (“head”) and gwyn (“white”), or from Latin pinguis (“fat”). See citations and the Wikipedia page. Here are also birds cal'd Pen-gwins (white-head in Welch) like Pigmies walking upright, their finns or wings hanging very orderly downe like sleeves [...]. (slang) A nun (association through appearance, because of the black かつ white habit). 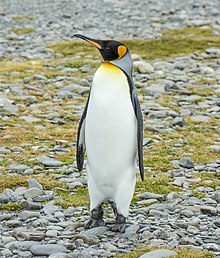 (juggling) A type of catch where the palm of the hand is facing towards the leg with the arm stretched downward, resembling the flipper of a penguin. A spiny bromeliad with egg-shaped fleshy fruit, Bromelia pinguin. These productive patches, and the houses, were each surrounded by a fence, made of a prickly shrub, called the Pinguin, which propagates itself with great rapidity. Penguin in the 1921 edition of Collier's Encyclopedia.